Set in downtown New York in 1900 - The Knick is a groundbreaking new scripted drama from Oscar® and Emmy®-winning director Steven Soderbergh starring Oscar® nominee Clive Owen, who also received a Golden Globe nomination for this series. 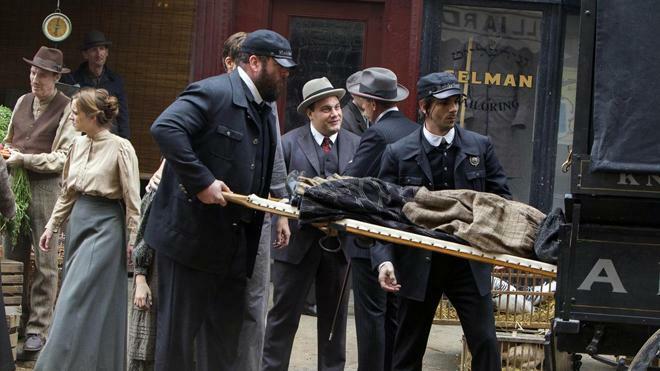 The Knick centers on the Knickerbocker Hospital (dubbed The Knick), which faces a major upheaval due to poor finances and an exodus of wealthy patients. The one remaining star is Dr. Thackery (played by Clive Owen) who along with the hospital staff of surgeons, nurses and other personnel must struggle to keep both themselves and the hospital going. For the most part, television is not really thought of as a director's medium. Since the majority of shows feature different work-for-hire filmmakers behind each episode, the small screen has never had the same reputation for "auteur" artistic expression as the movie industry. Coupled with accelerated shooting schedules, notably lower budgets than big-screen efforts, and several different writers throughout the season, many TV series have lacked singular cinematic perspectives. In recent years, however, this fact has been dramatically changing, in large part thanks to increasingly ambitious showrunners and pioneering cable series -- and with shows like 'True Detective' and 'Louie,' some efforts are even starting to feature the same director for every episode. 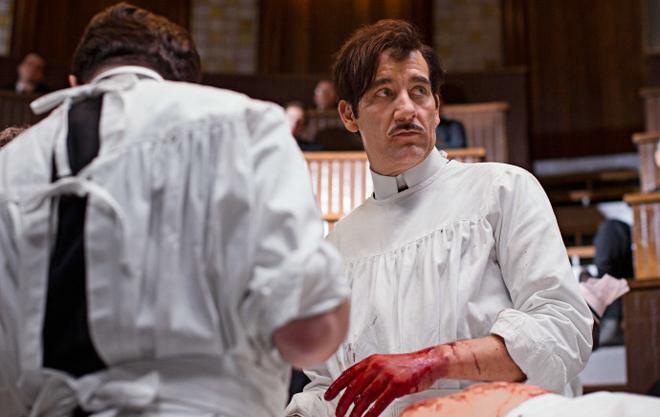 Following suit, Cinemax's 'The Knick' attempts to achieve a heightened level of stylistic cohesion by retaining the same director for each of its ten installments. And since that director happens to be Academy Award winner Steven Soderbergh, the resulting experiment ends up paying off tenfold. A daring medical drama, gripping character study, and ever-relevant examination of enduring social issues, the show is one of the most absorbing and visually arresting series on TV -- surgically reconfiguring the rules of television with a steady scalpel and a precisely guiding hand. Set in 1900, the story focuses on Dr. John Thackery (Clive Owen), a brilliant physician and surgical innovator as he attempts to advance the field of medicine into the 20th Century. While working at the Knickerbocker hospital in New York City, Thackery must combat increasing budgetary restrictions, racial tensions, and his own personal demons -- putting both the hospital and the doctor's futures in a fluctuating state of expansion and deadly peril. Fully using its turn of the century period to its advantage, the show offers a multifaceted look at the concept of and difficulties related to progress. As the scientific advances of modernity usher in exciting new medial techniques cast under brightly glowing light bulbs, the social hierarchy of the day continues to struggle with its own slowly building changes. Throughout the season we bear witness to various surgical innovations and breakthroughs juxtaposed against much more oppressive societal issues related to race, gender, and class, drawing sometimes surprising parallels to our own current problems in the 21st Century. Though X-ray machines may be embraced wholeheartedly, the idea of an African American doctor practicing in a white hospital is still a nearly unheard of taboo in 1900, revealing a rather fascinating dichotomy of growth and stagnation that goes on to fuel much of the series' drama. At the center of these developments, is Dr. Thackery himself. A radical innovator and maverick surgeon, the doctor also proves to be an obsessive cocaine addict who uses drugs to fuel his limitless energy and to dull the harsh mental and emotional tolls of his job. Through Clive Owen's complex performance, the man becomes a contradictory mesh of intoxicating genius and destructive flaws, resulting in a captivating (albeit familiar) character study. And joining Thackery, is an impressive ensemble of supporting characters that offer more insights into other aspects of early 20th Century medicine and society, including Dr. Algernon Edwards (André Holland), a gifted physician who is harshly discriminated against because of the color of his skin. The evolving conflict between Thackery and Edwards becomes one of the central arcs of the season, along with numerous subplots that include a typhoid outbreak, secret abortions, dangerous romances, and deadly debt collectors. Though the majority of these storylines end up paying off with engaging insights, and the serialization does help to differentiate the material nicely from standard medical procedurals, the show's writing is not without some minor stumbles. Eight of the ten episodes are scripted by the series' creators Jack Amiel and Michael Begler, and while this gives the season's writing a unified voice, the show is home to rather predictable dramatic beats and familiar characterizations. Maverick doctors struggling with addictions are nothing new on TV (just ask Hugh Laurie), and most of the final episodes' twists aren't very surprising. To this end, viewers can likely surmise all of the major season long character developments for Dr. Thackery based on the first episode alone. Of course, the broad strokes of the storytelling are only one part of the equation, and it's the deeper textures of the plotting, characters and, most importantly, the show's cinematic style that really elevates the series above most conventional TV efforts. Taking the reins for all ten episodes, director Steven Soderbergh brings a carefully honed in aesthetic to the series that feels meticulous and experimental all at once. Using a wide-array of cinematic techniques to suit the tone and intentions of each scene without ever clashing, the show truly feels like it's in the hands of a veteran filmmaker who knows exactly how to use the camera to enhance his storytelling. With that in mind, a mixture of extended takes and deliberately arranged cuts help to engender a unique rhythm throughout the season. Take the show's initial surgery sequence for instance. In this scene, Soderbergh employs an artistically constructed montage of shifting close-ups focused on the doctors' hands, surgical instruments, and patient's body, creating a riveting step-by-step look at the operation marked by an escalating tempo. In contrast, later scenes will eschew cuts in favor of sustained shots, extending the tension and reality of certain moments. For example, one sequence features Dr. Thackery treating a dying patient. The doctor then asks a nurse to fetch him some supplies, and without ever cutting away, the camera follows the nurse to the supply closet, fixes on her as she quickly gathers the requested items, and then continues with her back to the nearby exam room where we find the patient already dead. By letting the camera roll uninterrupted for the entire duration, the audience is allowed to feel the real lapse of time taken for the event, reinforcing the sense of urgency and the tragedy caused by the characters simply not being quick enough to save the man. Similarly impactful stylistic choices are made throughout the entire season, including handheld shots, low angle compositions, deliberate shifts in focus, and a few decidedly avante garde flourishes like a disorienting, freeze-framing over the shoulder fight scene that places us perfectly within the foggy, battered mindset of the character. Likewise, Soderbergh also has a tendency to avoid traditional coverage in favor of holding purely on the characters who matter most in a particular scene. One flashback party sequence, for instance, cuts back and forth between close-ups of three characters, never really allowing us to get a sense for the general geography of the room or even the number of people in it. We know it's a party thanks to the boisterous sound design, but as far as the camera is concerned, only our three principal characters exist, emphasizing their importance in a cinematically powerful and economical way. Beyond the standout direction, production designs are rather exemplary as well, offering an authentic period piece atmosphere with convincing costumes, sets, and locations. With that said, special note must really go the series' use of practical medical effects. The surgery scenes are absolutely incredible, thanks in large part to the disturbingly accurate and impressively detailed prosthetics. By keeping most of the effects work practical, the actors actually perform the surgical maneuvers in-camera, giving these frequently graphic sequences a rare sense of reality. In other words, this is not a show for those who might get squeamish at the sight of blood… or an amputated arm… or an exposed brain… or a disemboweled torso… or a... well, you get the picture. One of the most cinematically absorbing shows on TV, 'The Knick' is a unique artistic achievement in serialized storytelling. Thanks to Steven Soderbergh's skillful direction, the series features some of 2014's most impressive filmmaking... on any size screen. While HBO might get most of the attention for its prestige dramas, with more series like this, sister channel Cinemax may eventually steal the premium cable spotlight -- though, I must admit, "It's not TV, it's Cinemax," just doesn't have the same ring to it, does it? 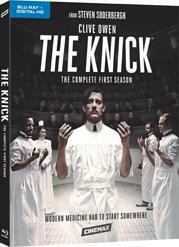 HBO brings 'The Knick: The Complete First Season' to Blu-ray on four BD-50 discs that come housed in a keepcase with a cardboard slipcase. Instructions for an UltraViolet/iTunes digital copy are also included. After some warnings and logos, the screen transitions to a standard menu. The packaging indicates that the release is region A coded. The show is provided with a 1080p/AVC MPEG-4 transfer in the 1.78:1 aspect ratio. Shot on the Red Epic Dragon digital camera, the series features an impressive visual style that looks fantastic on Blu-ray. Outside of some occasional noise in darker scenes, the digital source is free from any troublesome artifacts or compression issues. Clarity is strong throughout the season, bringing all of the period appropriate sets and costumes to life with intricate fine details and textures. Close-ups during the various operating scenes are especially impressive, highlighting the painstaking work done to make the effects look as realistic as possible. Shot mostly in low light and natural light conditions to match the 1900 setting, the show's colors adhere to a mostly drab palette, often emphasizing greys, blues, and browns, though there are some warmer hues in scenes cast under electronic bulbs. Likewise, red tends to pop nicely, emphasizing the contrast between blood and the doctors' white scrubs during surgeries. Contrast is balanced well and black levels are mostly deep and inky. With that said, dark portions of the screen do veer toward a noisy blue in certain sequences and shadow delineation can crush slightly. Fueled by Steven Soderbergh's impeccable visual style, 'The Knick' is one of the most cinematic shows on TV, and thankfully this Blu-ray transfer preserves the series' intentional aesthetic wonderfully. The series is presented with an English DTS-HD MA 5.1 track along with several foreign language options. English SDH, English, French, Spanish, Portuguese, Norwegian, Finnish, Dutch, Danish and Swedish subtitles are also included. Marked by immersive sound design and an enveloping electronic score, the mix does a great job of complementing the show's engaging visuals. Dialogue is mostly clean and clear, but there is some periodic background hissing that crops up when characters speak here and there. While this doesn't become a major concern, there are a few isolated scenes where it is rather noticeable. The soundscape is nicely layered with a good mixture of general ambiance and more specific design work. Background clatter from spectators in the surgical theater during operations is appropriately spread to the rears, and outdoor scenes offer a convincing sense of atmosphere with clanking horses and pattering footsteps. Effects work pans with smooth imaging across the soundstage when called for (carriages and trains passing), and objects (a ringing phone, etc.) and characters are naturally placed based on their location in the scene. Special note must also go to the show's thumping electronic score by Cliff Martinez, which juxtaposes perfectly against the period piece setting with fantastic range and deep bass. Enveloping and nuanced, the audio track helps to enhance the show's gripping atmosphere and unique style. HBO has included a solid assortment of supplements, including three commentaries and several featurettes. With that said, the featurettes prove to be disappointingly brief and director Steven Soderbergh is nowhere to be found. All of the bonus material is presented in 1080p with DTS 2.0 sound. Audio Commentary - Writers Jack Amiel & Michael Begler, and stars Jeremy Bobb, Eve Hewson, Michael Angrano, Chris Sullivan, Cara Seymour, and Eric Johnson offer commentary on episode one. The large group offers a lively and fun discussion mixing in some jokes and relevant information, including details about capturing the 1900 atmosphere, electronic music, modern visual style, realistic surgery scenes, working with Soderbergh, and the joys of Boar's Head cold cuts. Episode 102 Post-Op (HD, 3 min) – This brief featurette includes a few of the actors discussing the episode's developments, including Dr. Edwards hidden rage. Episode 103 Post-Op (HD, 2 min) – This brief featurette includes the cast and crew discussing the effects of syphilis and the surgery used to graft skin from the arm to the nose. Episode 104 Post-Op (HD, 2 min) – This brief featurette includes the cast and crew discussing the rivalry between Gallinger and Edwards, and rat stomping. Episode 105 Post-Op (HD, 2 min) – This brief featurette includes the cast and crew discussing Algernon and Thackery working together, and Gallinger's family struggles. Audio Commentary - Writers Jack Amiel & Michael Begler, and stars Jeremy Bobb, Eve Hewson, Michael Angrano, Chris Sullivan, Cara Seymour, and Eric Johnson offer commentary on episode seven. Once again, the gang provides an entertaining and informative track. We get details on the real-life basis for Dr. Thackery and the race riot, along with more joking around and admiration for the show's visuals. Episode 106 Post-Op (HD, 3 min) – This brief featurette includes a few of the cast and crew discussing the meningitis tragedy, the use of a robot baby, and Cornelia's tense bedroom encounter. Episode 107 Post-Op (HD, 2 min) – This brief featurette includes the cast and crew discussing the race riot plot and amputating a fake arm. Episode 108 Post-Op (HD, 2 min) – Another brief featurette includes a few the cast and crew discussing the decline of Dr. Thackery and the introduction of Dr. Zinberg. Audio Commentary - Writers Jack Amiel & Michael Begler, and stars Jeremy Bobb, Eve Hewson, Michael Angrano, Chris Sullivan, Cara Seymour, and Eric Johnson offer commentary on episode ten. For their final track, the group provides more production details and anecdotes, touching upon practical effects, script changes on set, and the use of few takes during the shoot. Like the precious tracks, this is a great listen. Episode 109 Post-Op (HD, 2 min) – This brief featurette includes the cast and crew actors discussing the characters' pregnancy troubles and the struggles of addiction. Episode 110 Post-Op (HD, 2 min) – This final brief featurette includes the cast and crew discussing the wedding, heroin, and anticipation for season two. 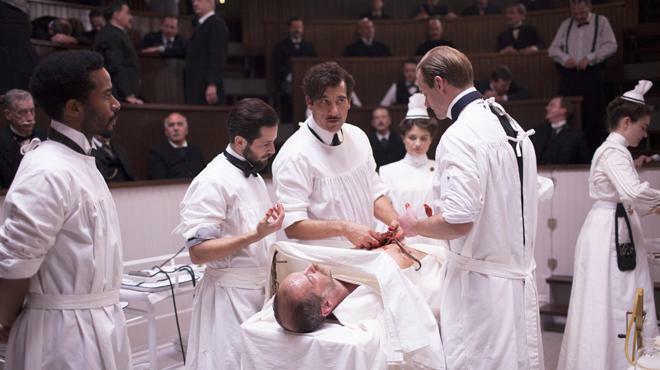 'The Knick' is one of TV's most cinematic and stylistically absorbing series. Thanks to Steven Soderbergh's expert direction, the medical drama becomes a unique small screen achievement, offering powerful visuals, engaging characters, and potent social commentary. On the technical front, these discs feature a fantastic video transfer and strong audio mix, preserving the director's intended aesthetic. Though the included featurettes are disappointingly brief, the commentary tracks are informative and entertaining. Criminally overlooked by many audiences and even some critics, the show now deserves to find a larger audience on Blu-ray. Very highly recommended.